Unionist Voice can today expose the secret PSNI briefings that created and perpetuated the allegations of threats being issued by the UVF to families in Cantrell close. A Freedom of Information request has revealed there was seven briefings provided to politicians and one authorised media briefing. At the time of the incident the East Belfast Community Initiative expressed concerns that the PSNI had given false briefings to the media and politicians, in a crude attempt to provide justification to direct paramilitary Task Force resources towards east Belfast loyalists. The first allegation of UVF involvement came from Sinn Fein, following a meeting with the PSNI. Therefore it appears that the genesis of the false allegations stemmed from either Sinn Fein, or the PSNI. Sinn Fein claimed publicly that they had been informed by the PSNI that the UVF were involved, yet the PSNI initially made clear that they did not know where the threat had come from. It was only after Sinn Fein’s whipping up of the allegations, which they claim stemmed from the PSNI, that the PSNI changed course and blamed the UVF. A Freedom of Information request has revealed that between 22 September and 3 October 2017 that the PSNI provided seven briefings to politicians on the issue. This was all prior to Chief Constable George Hamilton’s public statement on 5 October. So if the Chief Constable was not sure of his assessment prior to the 5 October, then what were the PSNI telling politicians during their secret briefings between 22 September and 3 October? 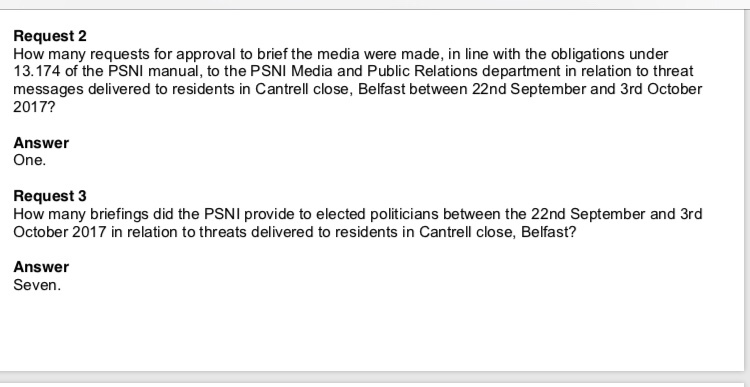 It has further been revealed that the PSNI requested approval to provide a media briefing in relation to threat messages delivered to Cantrell Close on one occasion between 22 September and 3 October 2017 on one occasion. This briefing was provided by Chief Superintendent Chris Noble on 28 September 2017. Given that ‘Police sources’ were quoted on a number of occasions subsequent to this date, it is clear that there were unauthorised media briefings by PSNI officers. The information gleaned via a Freedom of Information request raises serious questions for the PSNI, particularly around potential unauthorised briefings to the media and what information they were feeding politicians, prior to- by their own admission- they had come to any decision as to who to blame. 69 Responses to "NEWS: PSNI secret media and political briefings over Cantrell Close revealed"
This web page is known as a walk-via for the entire information you needed about this and didn’t know who to ask. Glimpse here, and also you’ll positively discover it. Attractive portion of content. I simply stumbled upon your site and in accession capital to assert that I acquire actually enjoyed account your weblog posts. Any way I’ll be subscribing in your augment or even I fulfillment you get entry to consistently quickly. Howdy! This is my 1st comment here so I just wanted to give a quick shout out and tell you I genuinely enjoy reading through your posts. Can you recommend any other blogs/websites/forums that go over the same subjects? Thanks! I do love the manner in which you have presented this specific concern plus it does indeed provide me a lot of fodder for consideration. However, from what I have witnessed, I only wish as other comments pack on that men and women remain on point and don’t get started upon a soap box involving the news of the day. Still, thank you for this fantastic piece and while I can not really concur with it in totality, I regard the perspective. I loved as much as you’ll obtain performed proper here. The sketch is tasteful, your authored subject matter stylish. nevertheless, you command get got an edginess over that you wish be delivering the following. ill without a doubt come more beforehand again as exactly the same just about a lot steadily within case you protect this increase. I have learn a few excellent stuff here. Certainly value bookmarking for revisiting. I surprise how much attempt you put to make any such wonderful informative website. Hello I am so delighted I found your weblog, I really found you by error, while I was looking on Digg for something else, Regardless I am here now and would just like to say thank you for a fantastic post and a all round enjoyable blog (I also love the theme/design), I don’t have time to read through it all at the minute but I have bookmarked it and also added your RSS feeds, so when I have time I will be back to read a great deal more, Please do keep up the awesome job. Hey would you mind letting me know which web host you’re working with? I’ve loaded your blog in 3 different internet browsers and I must say this blog loads a lot faster then most. Can you suggest a good hosting provider at a reasonable price? Thanks, I appreciate it! Have you ever considered creating an ebook or guest authoring on other websites? I have a blog centered on the same information you discuss and would really like to have you share some stories/information. I know my audience would appreciate your work. If you’re even remotely interested, feel free to send me an e-mail. Thank you for every other informative blog. Where else could I get that kind of info written in such an ideal method? I have a challenge that I am simply now running on, and I have been at the glance out for such information. The next time I read a blog, I hope that it doesnt disappoint me as much as this one. I mean, I know it was my choice to read, but I truly thought youd have something attention-grabbing to say. All I hear is a bunch of whining about something that you may repair when you werent too busy on the lookout for attention. I was just seeking this information for a while. After 6 hours of continuous Googleing, finally I got it in your site. I wonder what’s the lack of Google strategy that don’t rank this kind of informative sites in top of the list. Normally the top sites are full of garbage. Thank you so much for providing individuals with remarkably nice opportunity to read from here. It’s always so lovely plus packed with a lot of fun for me and my office mates to search your website at the very least thrice a week to learn the fresh guidance you will have. And of course, we’re actually astounded for the unique principles you serve. Some two areas in this posting are truly the best we have all ever had. My brother suggested I would possibly like this blog. He was totally right. This post truly made my day. You can not believe simply how a lot time I had spent for this info! Thank you! hey there and thank you in your information – I have definitely picked up anything new from right here. I did alternatively experience some technical points using this site, since I experienced to reload the website a lot of instances prior to I may just get it to load correctly. I were wondering if your web hosting is OK? Now not that I am complaining, however sluggish loading cases occasions will often impact your placement in google and could damage your quality score if ads and ***********|advertising|advertising|advertising and *********** with Adwords. Anyway I am including this RSS to my e-mail and can look out for much more of your respective fascinating content. Make sure you update this again very soon..
Do you mind if I quote a few of your articles as long as I provide credit and sources back to your blog? My blog is in the exact same niche as yours and my visitors would truly benefit from some of the information you present here. Please let me know if this alright with you. Thank you! Hi, i read your blog from time to time and i own a similar one and i was just wondering if you get a lot of spam feedback? If so how do you prevent it, any plugin or anything you can recommend? I get so much lately it’s driving me mad so any help is very much appreciated. We absolutely love your blog and find many of your post’s to be exactly I’m looking for. Do you offer guest writers to write content for you personally? I wouldn’t mind writing a post or elaborating on many of the subjects you write concerning here. Again, awesome site! Hi would you mind stating which blog platform you’re using? I’m planning to start my own blog soon but I’m having a difficult time choosing between BlogEngine/Wordpress/B2evolution and Drupal. The reason I ask is because your layout seems different then most blogs and I’m looking for something completely unique. P.S Apologies for getting off-topic but I had to ask! There are certainly loads of details like that to take into consideration. That may be a great level to bring up. I supply the ideas above as basic inspiration but clearly there are questions just like the one you bring up where an important factor might be working in trustworthy good faith. I don?t know if finest practices have emerged around issues like that, but I am sure that your job is clearly recognized as a good game. Both boys and girls feel the impression of only a second’s pleasure, for the rest of their lives. I precisely needed to thank you very much once again. I’m not certain the things I might have undertaken without the techniques revealed by you relating to such a problem. It actually was a very traumatic matter in my position, nevertheless discovering the very skilled fashion you dealt with that forced me to jump over happiness. I am just happier for the help and pray you recognize what an amazing job you happen to be carrying out training the mediocre ones using a blog. Most probably you’ve never encountered any of us. Thanks a lot for providing individuals with such a superb possiblity to check tips from this web site. It’s always very sweet plus full of amusement for me personally and my office acquaintances to visit the blog at a minimum three times in one week to learn the new guides you will have. Of course, we’re at all times contented considering the amazing tactics you serve. Certain 4 facts in this post are basically the most impressive we have had. Excellent web site. A lot of useful info here. I’m sending it to several friends ans additionally sharing in delicious. And of course, thank you on your sweat! Hey There. I discovered your blog the use of msn. This is an extremely smartly written article. I’ll make sure to bookmark it and come back to read more of your helpful info. Thank you for the post. I will definitely comeback.